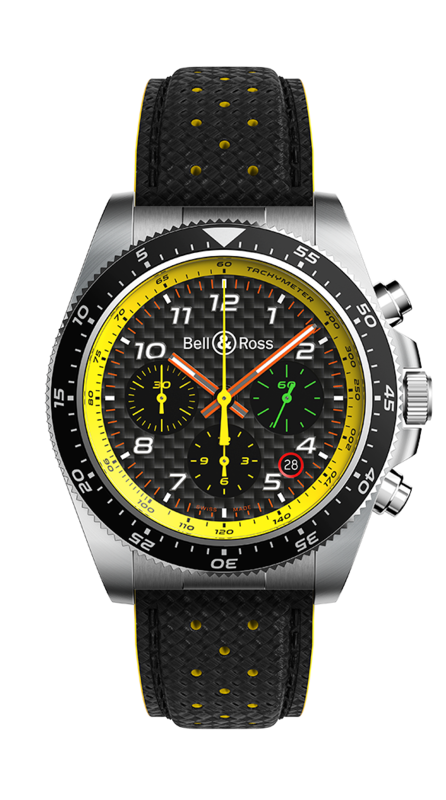 Bell & Ross and Renault F1® Team are racing into the 2019 season with a stronger-than-ever relationship, kept on time by four thrilling new driver’s chronographs of the R.S.19 collection. Functions: hours, minutes, small seconds at 3 o'clock. Date. Chronograph: 30-minute counter at 9 o’clock, 12-hour counter at 6 o’clock, central chronograph seconds. Case: 43 mm in diameter. Satin-polished steel. Bi-directional rotating steel bezel with black anodised aluminium ring with scale and countdown timer. Screw-down crown. Sapphire case back. Strap: carbon-effect calfskin or satin-polished steel.